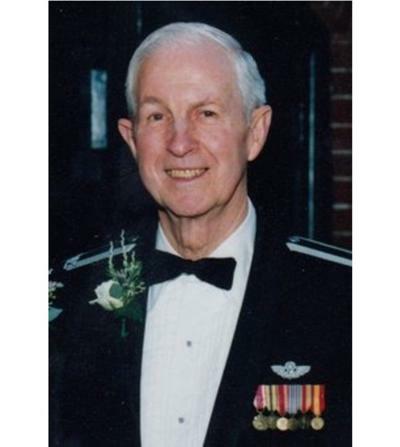 FIDEN, Colonel Thomas John William, USAF Ret., 94, of Richmond, Va., passed away Saturday, January 19, 2019. Raised in Buffalo N.Y., Col. Fiden graduated with an Aeronautical Engineering degree from the Air Force Institute of Technology. He proudly served his country in the United States Air Force as a Triple Rated Command Pilot from 1946 to 1976. While at Strategic Air Command, he set the record for the fastest Trans-Atlantic flight from Maine to England in a B-47 Stratojet. Col. Fiden also holds the record for the first nonstop flight from California to Japan, where he refueled in flight three times. Col. Fiden retired as the Director of Missile Facilities at S.A.C. Headquarters in Omaha, Neb. After moving to Richmond in 1977 to work as Director of Engineering at St. Mary’s Hospital, he finished his career in Plant Operations at MCV-VCU. He was a Fourth Degree Knight of Columbus at St. Bridget Catholic Church and was an active member of the American Legion. He was preceded in death by his brothers, Charles Fiden (Ruth) and Robert Fiden; and his parents, Casper and Lydia Fiden. Tom is survived by his loving wife of 51 years, Virginia Fiden; daughter, Lydia “Dia” Flora (Jason); son, James “Jamie” Fiden (Marisha); four grandchildren, Everette and Anna Flora and Philip and Nicolai Fiden; brother, Donald Fiden (Patricia); and numerous cousins, nieces, nephews and godchildren. The family will receive friends and family Thursday, January 31, 2019, from 2 to 4 and 6 to 8 p.m. at Bliley’s-Central, 3801 Augusta Ave., where a prayer service will begin at 7:30 p.m. A Mass of Christian Burial will be celebrated at 10 a.m. Friday, February 1, 2019, at St. Bridget Catholic Church. Interment will be private. Please consider donations to the Knights of Columbus, VA Council #5476 and/or to the American Legion VA Post #361.